Natural movement is not in straight lines, as we covered in the dendritic pattern, but in spirals and spiraling vortices it was once said. Thus this article focuses on the spiral pattern where the next article focuses on vortexes and their motion inducing forms. With that, the pattern of the spiral in nature is one found in a huge variety of scales and there is a thin veil between the spiral and the motion that it induces to become a vortex. It’s a fine balance but we will look at more of the static approach to the shape but also in its 3 dimensional form without a strong movement. With that, each year the mark of spring and renewal of life in some cultures is the unfurling of the fern (below left picture). In Maori culture the fern and its spiraling outward motion each spring is a vastly important symbol and reflection of their philosophy. 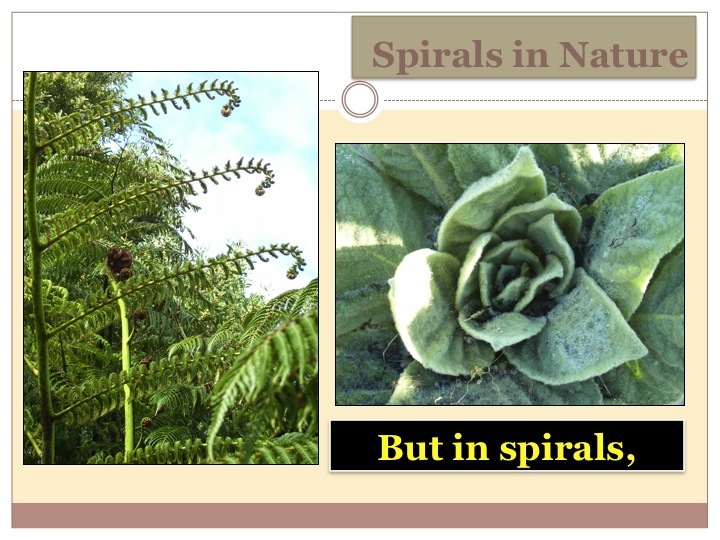 Each main stalk, each branch from there, and each leaf from there spirals outward from its emerging compact spiral. This fractal of spiral upon spiral upon spiral is a manifestation of energy that springs upward in a sprayed form and leaves behind an elegant but strong essence. This is similar to the other picture of the slide, the mullein plant on the right. This plant grows in very tough conditions early on in succession and is a medicinal plant and not surprisingly a dynamic accumulator and de-compacter of the soil. It is good for the lungs as a medicinal plant and literally brings gaseous exchange in the soil with its tap-root and ability to deal with compacted soils. To grow efficiently in these tough conditions it uses a spiraled leaf arrangement as to pack as much photosynthetic energy into its core body. With this efficiency and soft texture and energy conversion through its leaves, its tap root does the dirty work below of succession. This efficient pattern of harnessing photosynthetic energy creates the right conditions for it to thrive and leads succession onward thus building a more diverse and complex system above and below the ground. Spirals are quite often mapped numerically through the Fibonacci sequence as it pertains to the golden ratio (phi- 1.6180339887498948482…). Spirals are so well proportioned through this mathematical order that proportion and symmetry is what gives them such beauty. 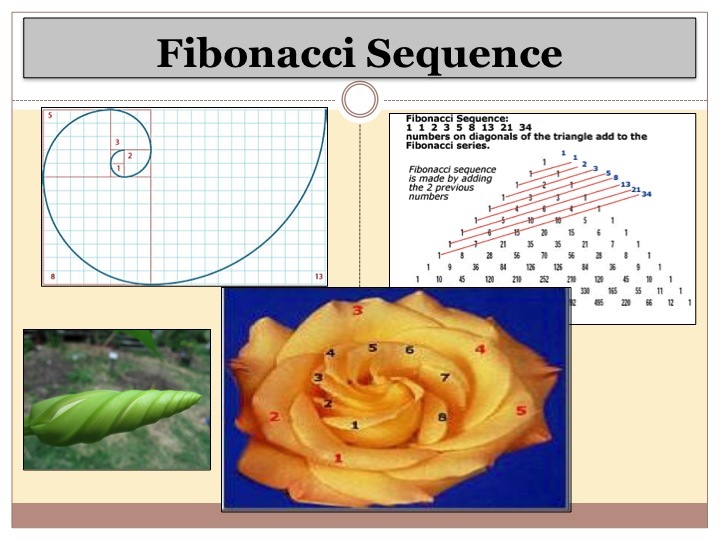 Take the rose example from the slide below and its eight ascending petals and five descending petals which are numbers in the Fibonacci sequence. The form of the spiral and its subsequent proportion is subtle but nonetheless there and creates a framework of what we consider beauty. This flower is iconic to say the least, it’s a symbol of love after all. Furthermore, I have to say I was quite delighted when I stumbled upon the flower on the bottom left of the slide below. I was at the carbon farming course at The Farm in Tennessee in 2009 and came across this vine trellising upward and was able to do prolonged observation of its flowering cycle. The spiral motion is getting ready to quickly release the flower when the conditions are right as its compact center is just waiting to burst out through this spiral. Its proportion to the golden ratio Phi is quite obvious which again evokes a sense of beauty and cycles. From snail shells to flowers, these patterns can give us a lot of inspiration to bring beauty into functionality that facilitates efficiency and strength through elegance. The snail-shell is a great representation of a natural building technique that is becoming more widely known and proving to be a worthwhile investment; reciprocal roofs. It can be seen on the right in the slide below, which is a picture of the house of my mentors in New Zealand, Robina McCurdy and Huckleberry Leonard. It’s beautiful, strong, and evokes a sense of a deeper meaning through a spaciousness and a cyclical form. All the while, it is great for earthquake prone areas and employs timber framing to pull off this space saving technique for building roundhouses. Having a pole in the center of a round house can throw off the vibe inside as I have been in both with and without. 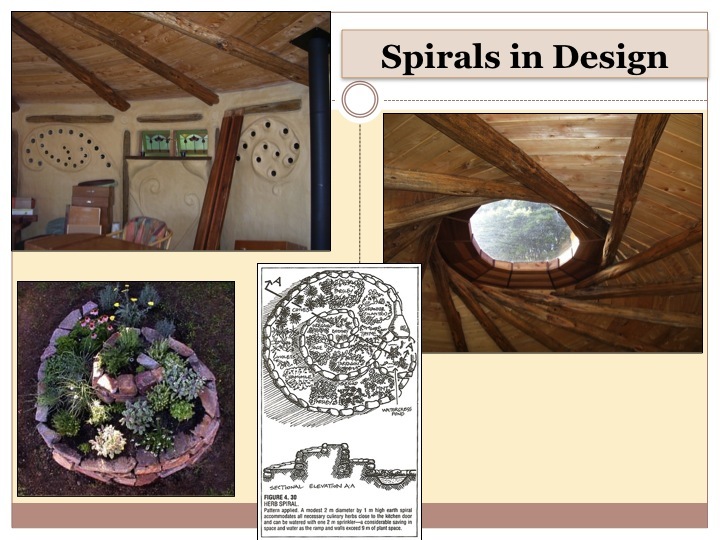 The reciprocal roof and the spiral pattern brings the dweller’s attention upwards and reminds us of our connection beyond the physical earth. It creates a subtle sense of motion, one that we should all have in evolving our inner landscape and our dynamic outer permaculture landscapes. These 13 timbers lay one on top of each other holding themselves up which a bit like our interconnecting 13 senses. Also to invoke the spiral in this house further, a fern bottle wall was used to bring the remembrance of the Maori and their teachings around the spiral. From there a classic Permaculture element is a must for discussion in this article; the herb spiral. With its ascending spiral layout, this feature creates a 3-D growing space outfitted with numerous microclimates when built tall enough and orientated properly. The herbs that like it high and dry are planted on the top and western side while those that like more moisture can go lower and on the shadier sides of north and east. It is built with bricks or rocks to support the heap of earth going upward and even a small pond can create a downward edge for another type of wet loving herb. These can be very eye catching features especially when done with proportion in mind as it embodies the essence of the spiral. It goes in relative location to the kitchen and the terra-forming brings a place of social interaction as we have seen with ours at Terra Alta in Coastal Portugal. These physical manifestations of the spiral pattern are exemplarily of the spirals ability to circulate energy and give strength through resilience in designs. glad you like tie dyed?